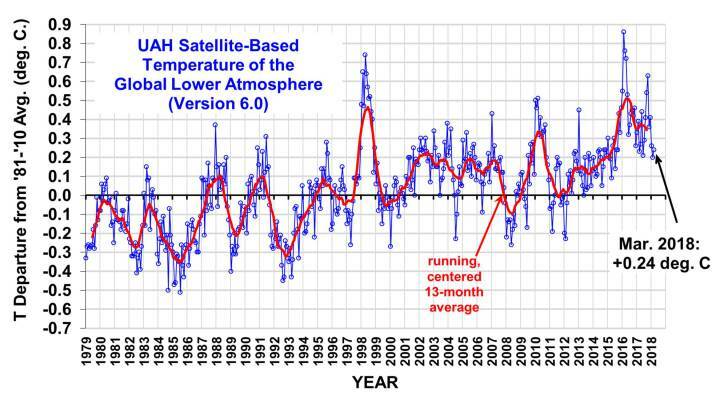 No serious person can deny that global temperatures are warming (see chart below) and mankind is a major cause of this geologically recent trend. Nonetheless, a real scientific debate continues in the climate science community regarding exactly how fast the globe is warming and exactly what is humankind’s contribution to that warming relative to natural variation. And with respect to the higher order impacts of global warming, such as rising sea levels, heat waves and tropical storm intensities, there is even more uncertainty, though most climate scientists agree sea levels will rise, heat waves will be more frequent, and tropical storms will be more intense, on average. On one side of the debate is the vast majority of climate scientists who argue we will see global temperatures increase by at least 3.0°C over pre-industrial levels by 2100 with catastrophic results to the environment. I refer to them as climate alarmists as the term conveys the urgency they feel about the importance of converting the world economy to renewable energy sources as soon as possible. On the other side of the argument is a small group of scientists that believe the forecast models are wrong and over-estimate the rate at which the earth is warming and under-estimate the role natural variation plays in the current warming trend. The obvious term for them may be ‘climate non-alarmists’ but I call them climate realists. They don’t deny the science, even as they question the panic mode endorsed by the climate alarmists. Climate realists refuse to go away to the consternation of many in the climate science community. The reason revolves around the term: equilibrium climate sensitivity (ECS). And if a recent climate study published in the Journal of Climate is an indication, its actual value is still uncertain. The ECS estimate is a summary of the eventual warming of the planet’s surface from a doubling of CO2 once the world’s climate system has adjusted to the higher levels of CO2. Estimates of the ECS are important because they drive conclusions on whether the globe will experience catastrophic temperature increases by the end of the 21st century. If the Intergovernmental Panel on Climate Change (IPCC) is correct, global temperatures will be 3.1°C higher than pre-industrial levels by 2100. But a new study in the Journal of Climate is now suggesting the IPCC’s ECS estimate might be too high by a factor of two. Dr. Judith Curry, a climate scientist and former Chair of the School of Earth and Atmospheric Sciences at the Georgia Institute of Technology, and Nicholas Lewis, a retired financier with a background in mathematics and physics, report in their study an ECS estimate of 1.66°C (5–95% uncertainty range: 1.15–2.7°C). Why does their model not run as hot as IPCC global temperature models? 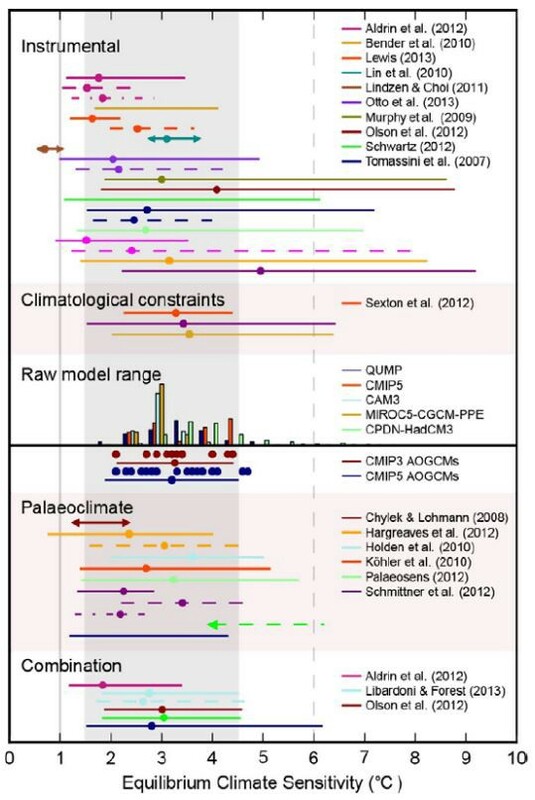 They say for two reasons: their model (1) takes into account historical atmospheric and ocean temperature trends since the mid-19th century, and (2) draws on new findings since 1990 of how atmospheric ozone and aerosols are likely to affect global temperature trends. Their critics, of which there are many, cite other reasons for their ‘less warm’ temperature forecasts. Dr. Drew Shindell, a climate scientist at NASA, has found in his research that studies based on observed warming (such as the recent low climate sensitivity study Lewis and Curry) have underestimated the sensitivity because they did not account for the greater response to aerosol forcing.In other words, Lewis and Curry’s temperature model is too simplified to make reliable forecasts. There is another reason to be cautious of Lewis and Curry’s 2018 research finding of lower climate sensitivity to CO2. Dr. Malte Meinshausen, of the Potsdam Institute for Climate Impact Research in Germany and the University of Melbourne’s School of Earth Sciences, cautioned about over-interpreting lower estimates for climate sensitivity. If these lower ECS estimate are correct it “only results in a delay of less than a decade in the timing of when the 2°C threshold would be crossed,” according to Meinshausen. 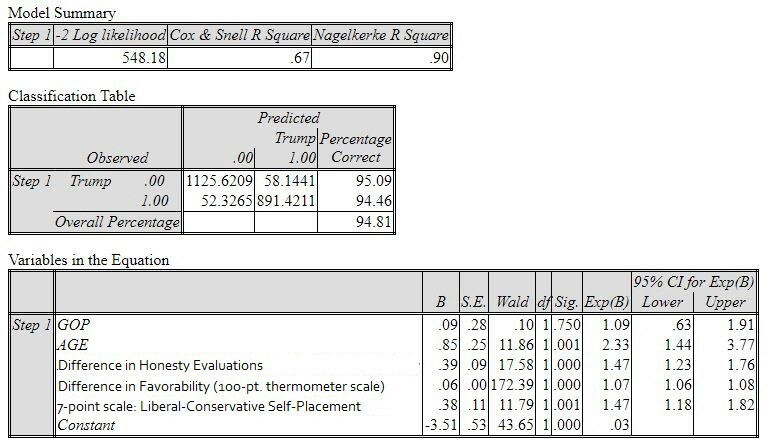 Climate alarmists on a principled level believe the relationship between science and public policy demands greater weight be placed upon the research estimating higher levels of climate sensitivity. The mainstream media’s oft-repeated exaggeration that the climate science is settled only hardens the partisan divide between the scientific community and defenders of the fossil fuel economy. And, besides, when is science ever settled? Einstein is still defending his theories of general relativity and special relativity. Though a critic of Lewis and Curry’s research, one climate scientist acknowledges the climate science, particularly with respect to climate sensitivity measures, is not settled. “Climate sensitivity remains an uncertain quantity,” according to Professor Piers Forster of the University of Leeds, who published a study with Jonathan Gregory of the University of Reading in 2006 that gave an ECS estimate of 1.6°C for a doubling of CO2. Morevoer, if Lewis and Curry’s ECS estimates were the lone outlier, their research would be easier to dismiss. But their estimates don’t stand alone. In the July 2017 issue of Nature Climate Change, climatologists Thorsten Mauritsen of the Max Planck Institute for Meteorology and Robert Pincus of the University of Colorado reported an ECS of 1.5°C (0.9–3.6°C, 5th–95th percentile). And one of the original ‘climate realists,’ Dr. Richard S. Lindzen, a climatologist at the Massachusetts Institute of Technology, and a colleague, Yong-Sang Choi of Ewha Womans University (Seoul, Korea) reported an ECS estimate around 1.5°C in their 2011 study. As seen in the chart below, most recent model estimates of the ECS are around 3.0°C, twice that of Curry and Lewis (2018), Mauritsen and Pincus (2017), and Lindzen and Choi (2011). There is real variation in this chart that simply cannot be dismissed as the sole product of the global warming deniers. At this juncture, the safer bet may be to assume the ECS estimates around 3.0°C are more accurate. However, scientific insurgencies must start somewhere and it is becoming increasingly untenable for climate change alarmists to ignore research suggesting the planet may not be warming as fast as once assumed. In addition, the global warming hiatus between 1998 and 2015 remains at the center of the debate regarding the relative contribution of man-made sources of greenhouse gases and natural variation. If man is responsible for 100 percent of the global warming since 1950, as suggested by NASA climate scientist Gavin Schmidt, how do we explain the pause without reference to natural variation? And can we assume natural variation cancels itself out over the long-run, as suggested by climate alarmists, leaving only anthropogenic factors as the cause of current global warming? “Climate models do not simulate correctly the ocean heat transport and its variations,” said Curry. Lewis and Curry are not deniers of anthropogenic global warming. By including them in the three percent category of global warming deniers, the mainstream of the climate science community is doing their discipline a disservice. While Lewis and Curry have undoubtedly accepted research monies from wealthy interests that do deny the realities of global warming, their climate research is credible enough to be published in peer-reviewed journals and wholly consistent with the consensus that humans have impacted the global climate through the production of greenhouse gases. Their heresy is that they believe the pace of this warming and the relative contribution of humans versus natural causes remain open questions. They may be wrong. But criticism of their research should be solely driven by scientific considerations, and not by political agendas. Climatologist Michael Mann’s famously direct disrespect for a congressional committee’s inquiry into global warming in 2017 highlights the poisonous environment within which climate science now operates. Bill Ritter, Jr., a professor at Colorado State University and director of the Center for the New Energy Economy, recently suggested the controversies in the climate science are increasingly becoming irrelevant as market forces have moved decisively towards converting the U.S. to a clean energy economy. Climate alarmists can be largely thanked for the positive trends in renewable energy. Assuming utilities continue in their efforts to convert from fossil fuels to renewables, climate scientists should find it easier to free themselves from the partisan squabbles that presently loom over their research and, instead, return to what Thomas Kuhn called “normal science,” where the regular work of scientists is in theorizing, observing, and experimenting within a settled paradigm or explanatory framework. The fact that research by climate realists such as Lewis and Curry is now regularly appearing in peer-reviewed scientific journals is evidence that “normal science” is returning to the climate science community. The better news is, in twenty or thirty years, we will know who got the climate science right and who didn’t. That’s how science should work. About the author: Kent Kroeger is a writer and statistical consultant with over 30 -years experience measuring and analyzing public opinion for public and private sector clients. He also spent ten years working for the U.S. Department of Defense’s Office of the Under Secretary of Defense for Personnel and Readiness and the Defense Intelligence Agency. He holds a B.S. degree in Journalism/Political Science from The University of Iowa, and an M.A. in Quantitative Methods from Columbia University (New York, NY). He lives in Ewing, New Jersey with his wife and son. Cartoonist Charles Schultz was a subversive. Lucy Van Pelt pulling the football away from Charlie Brown at the last second was his metaphor for the insincerity and duplicity of the power elites. Lucy was the power establishment. Charlie Brown was the rest of us. Progressives today may not want to be associated with Charlie Brown (he seemed to lose a lot), but there is no shame in that comparison. Charlie Brown was honest, trusting, and pure of heart. There is no dishonor there. As our mainstream media teed-up another superfluous non-issue to relentlessly grind on (this time it was Trump’s lawyer, Michael Cohen), a progressive leader had the gall to suggest her party’s pursuit of the current president should not blind them to a real issue: Americans’ civil rights. What will it take for Democratic Party progressives to realize they are no longer welcome in their own party? Since 1992, there have been two political parties in this country: the traditional Republican Party, led (for now) by Trump, and the Pro-Choice Republican Party, otherwise known as establishment Democrats, led by Obama administration holdovers, such as Tom Perez, and the smoldering embers of what is left from the Clinton political machine. Since Bill Clinton took control of the Democratic Party in 1992, our nation has effectively lived under one-party rule, where the two nominal parties wage electoral battles on social and culture war issues, distracting voters from the real economic issues that most impact people’s lives. And Donald Trump is the Frankenstein monster this one-party-system has created. It’s a system that ignores the economic realities of working-class and middle-class Americans. It’s a system that allows income disparities on a scale not seen since the robber baron era in the late 19th-century. It’s a system that pretends the covert drone wars perpetuated and refined by the Obama administration are antiseptic enough to keep our political leaders’ hands clean while they proceed to destabilize Muslim-majority countries not sufficiently suppliant to American interests. And now the establishment Democrats demand discipline from the progressive wing of their party in order to slay a creation of their own making — Donald J. Trump. Progressives, don’t fall for the con. Donald Trump came to power on their watch, not yours. In their heart, progressives know Democratic Party leaders no longer welcome them and every day progressives try to bring their concerns and ideas to the attention of the party elites, is a day they’ve lost turning those concerns and ideas into actual public policy. It’s a political system where bank executives and fund managers are allowed to sponge billions of dollars from average Americans through fraudulent underwriting practices and deceptive risk pricing (among other causes of the 2007–2008 financial crisis) and not ONE goes to jail. Eight years of the Obama administration and no banker goes to jail for their naked theft of billions of dollars?! Establishment Democrats are in no position to lecture progressives about the dangers of the Trump administration. Not when Democrats controlled both congressional chambers for first two years of the Obama administration and fulfilled his campaign promise of affordable, universal health care by passing a Republican-designed health care plan, the Affordable Care Act (ACA). Did progressives ever ask Obama, if you are going to pass a health care law without the support of Republicans, why not bite the whole enchilada and pass a true universal health care plan? Bernie Sanders and Michael Moore did. Who else? Many progressives still don’t want to hear this fact: Obama and the establishment Democrats’ health care, Big Pharma and insurance industry donors were never going to allow substantive health care reform. It was all a con, sold to progressives by an intelligent and charming community organizer from Chicago. This is not cynicism. This is how government works in a one-party-system. False choices. Pre-determined outcomes. And, now, those same establishment Democrats are demanding progressives get in line and take down Trump and the Republicans. When progressives suggest the media’s obsession with the Trump presidency, particularly the Trump-Russia collusion story, is a distraction from genuine issues, the establishment Democrats quickly stomp the thought out through shaming and rich-splaining. Never mind that the policy constants of the past thirty years supported by these same Democrats, globalist economics (deregulation and open markets) and neocon regime change wars (Afghanistan, Iraq, Libya, and now Syria), have left this country with dangerous amounts of public debt, increased income inequality, and seemingly irreconcilable social divisions. These policies laid the groundwork for the populist uprising in the Republican Party and is directly responsible for the rise of Donald Trump. It takes real balls for the establishment Democrats to then turn around and blame progressives for the election of Trump. There comes a time when it takes one step backwards before you can take two steps forward. This is that time for the progressives. Two intersecting forces make NOW the time for the progressives to show their strength. The first force is the impending implosion of the Republican Party under Trump’s incompetent leadership. Not even Nikki Haley will save the party by the time the 2020 election comes around. The Republicans are a dead-party-walking. The second force is the overwhelming expectation that the Democrats will regain control of the U.S House in 2018. Perhaps even the U.S. Senate is in play. Progressives must understand this simple reality: Establishment Democrats are Republicans. They have seduced progressives with their socially liberal inclinations, though progressives should have had a clue at their insincerity when it took Hillary Clinton until 2015 to publicly declare her support for marriage equality. You may have been with her, but she was never really with you. The humble truth is, when establishment Democrats win, the Republicans win. The progressives must therefore focus on taking back their own party from establishment Democrats before taking on the Republicans. 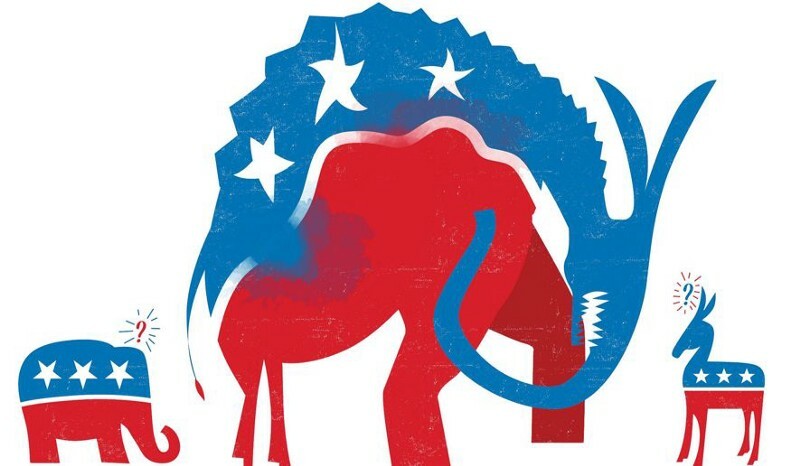 The progressives have no chance of rolling back Republican policies until the establishment Democrats are shown the door and gifted back to the Republican Party where they belong. 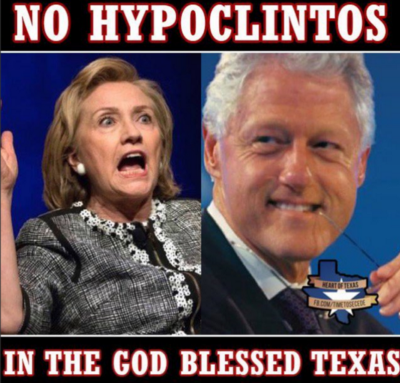 Let the Republicans have Bill and Hillary Clinton. Trust me, the Democratic Party won’t miss them. So, for those progressives that recognize the establishment Democrats’ big con, what next? Where progressive Democrats have already won the party nomination. the task is straight forward: Get them elected. In many states, it is already too late to put up progressives Democrats in the primaries. The only option now is to run progressives as independent party candidates in the general election. 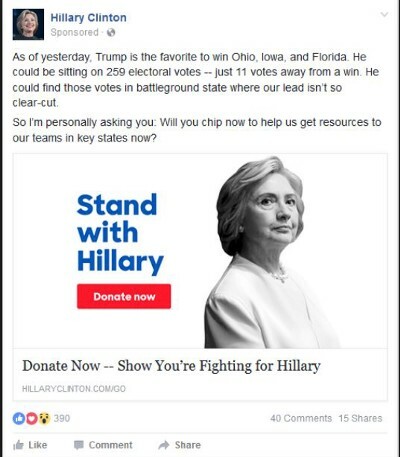 Bernie Sanders’ supporters have built the grassroots fundraising and electioneering infrastructure necessary to organize a nationwide candidate filing program for the general election. A more complete list of filing deadlines is here. In those states where deadlines are missed, progressives can partner with other minor parties (such as the Green Party) with candidates on the general election ballot. Yes, if successful, this strategy will keep the Republicans in power another two years. That is the price progressives must pay for allowing Republicans to usurp control of the Democratic Party in 1992 and letting them carry the party’s banner for the next 26 years. Progressives will never beat the Republicans in Congress until they beat them in their own party. How the establishment Democrats continuously mistreat and marginalize people like Nina Turner tells us all we need to know about their true intentions. Progressives, now is the time to take back your party. The chances are still good that the Democrats will win control of at least the U.S. House this November. The prediction market PredictIt.com gives the Democrats a 69 percent chance of gaining control of the U.S. House. And while the same market gives the Democrats only a 38 percent chance of controlling the U.S. Senate, those are odds the Democrats only a year ago would have made them giddy with optimism. My own midterm election models (which you can access here) indicate, under current conditions, the Republicans will lose 37 House seats and 4 Senate seats, putting both chambers under the control of the Democrats. The smart money remains solidly in the Democratic Party’s corner for the 2018 midterms. Yet, with the 2016 presidential election as a vivid reminder, Democrats know there is no such thing as a ‘sure thing’ in American politics. Despite a year and a half media obsession over the Trump-Russia collusion investigation, on November 7th, the Democrats could still find themselves in the minority in both congressional chambers. For 18 months the Trump-Russia collusion story has dominated the national news media. According to the Tyndall Report, among the Top 20 news stories of 2017, Russia-related stories accounted for 31 percent of the coverage by the three broadcast news networks. The ratio for the cable news networks undoubtedly would be even higher. Yet, after all this hostile coverage of the Trump presidency, Democrats need to prepare themselves for this real possibility: The Robert Mueller-led investigation probably will not indict Donald Trump. And what can we expect from the Mueller probe with respect to President Trump? According to Rosenzweig, he will file a report on his findings with the deputy attorney general, Rod Rosenstein (since the Attorney General Jeff Sessions has recused himself). We are going to get a report. And based on what has been revealed so far, the chances of the Mueller probe proving Trump (or anyone in his orbit) colluded with the Russians to impact the 2016 election is less than certain. Such an ambiguous outcome might further energize #TheResistance’s resolve to put the Democrats in charge of Congress. But it also has the potential to torpedo the movement’s organizing assumption that Trump is not just a misogynistic buffoon, but a traitor. The reality that Trump is not a Russian tool will be deflating for many of his critics. Democrats should be concerned about another potential outcome of the Mueller probe. The American public may not just grow weary of the Trump-Russia collusion story, a significant percentage may rally around the president, particularly if the economy remains strong and real progress towards peace is achieved on the Korean peninsula. There is an historical precedent for this phenomenon. Kenneth Starr’s probe into an array of controversies surrounding President Bill Clinton, including his relationship with Monica Lewinsky, resulted in the House impeaching the president on Dec. 19, 1998. 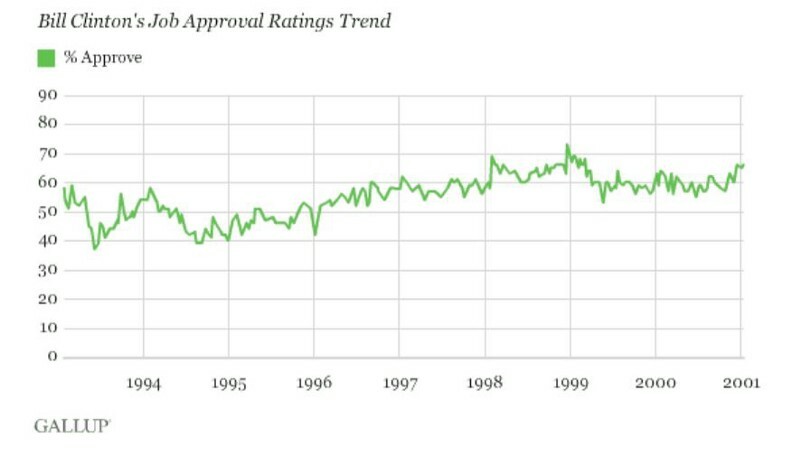 Interestingly, as evidenced in the graph below, Clinton’s Gallup job approval ratings rose consistently until the House impeachment. And though his ratings did dip during the Senate trial (in which Clinton was not convicted), they never dropped below 50 percent. Of course, how Americans react to Trump’s impending impeachment (assuming the Democrats take the House back) may be very different from the Clinton experience. According to the April 2018 Quinnipiac poll, 52 percent of Americans believe Robert Mueller is conducting a “fair” investigation. While still a majority, this is the lowest level of support the Mueller probe has received from the American public. Is this evidence of “Mueller probe fatigue”? Perhaps. At a minimum, the Democrats would be well advised to track the public’s mood with respect to the Mueller probe, particularly among independents and Democratic-leaning voters. Should either segment show growing signs of ‘Mueller fatigue,’ the Democrats will have a problem in November. The economy is not working in the Democrats’ favor either. It shows no signs of slowing down, even with trade wars lurking about. Whether the credit belongs chiefly with Barack Obama or with Trump is anyone’s guess. What does matter is to whom the American people give the credit and the most recent evidence, from an April 2018 Quinnipiac University poll, is that a plurality of Democrats (!) now believe Trump — not Barack Obama — is responsible for the current strength of the country’s economy. As of April 9, 46 percent of Democrats agreed that Trump is more responsible for the United States economy’s current strength is due to Trump. According to the New York Fed’s yield curve model, there is an 11 percent probability of a recession in the United States in the next twelve months (please check out this model’s accuracy here). The Democrats are not likely to get any help from a souring economy when election day rolls around and they will face an opposition party that will try to make the election all about the economy. If I were a betting man (and I am), I would say the economy is not going to help the Democrats in November, not that they need it to since midterm election results are not a simple function of the economy. Nonetheless, the Democrats’ chances of taking back Congress would be better if the economy wasn’t humming along as it is. The impending meeting of Trump and Kim Jong Un is the ultimate wild card before the midterm elections. It is easy to make glorious predictions (positive or negative) about any tangible outcomes coming from this meeting, but there is simply no way to know. History suggests the chances are near zero that concrete steps towards a real peace agreement will arise from this first meeting. Nonetheless, just the novelty of it and the positive coverage likely to surround it works in the Republicans’ favor. Short of a physical brawl breaking out between Trump and Kim Jong Un, it very probable that Trump’s image will benefit substantially. And, frankly, a fist-fight might lift his image as well with a lot of Americans. There are already “tentative” signs that Trump’s worst days in terms of job approval ratings may be over. 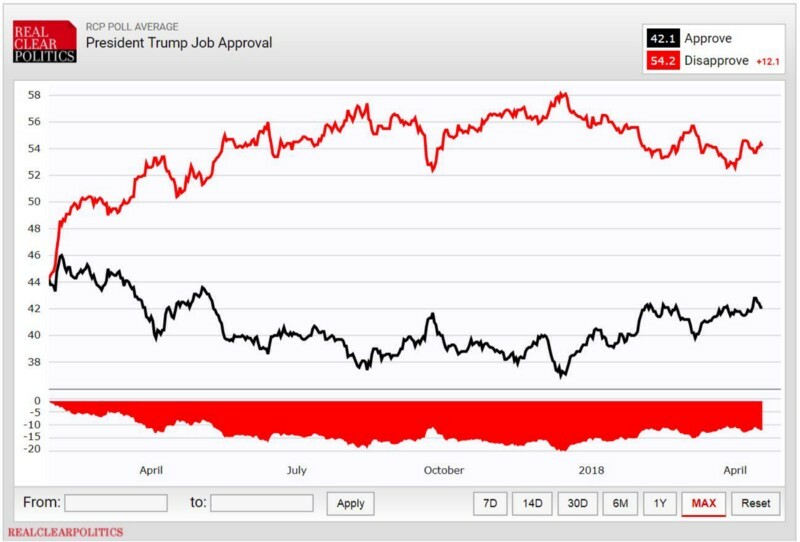 Trump’s job approval ratings have been slowly but steadily rising for the past four months. This is the longest sustained increase (+3%) in his numbers for his young presidency. Of course, it would take just one ill-considered tweet for him to lose all of this improvement. 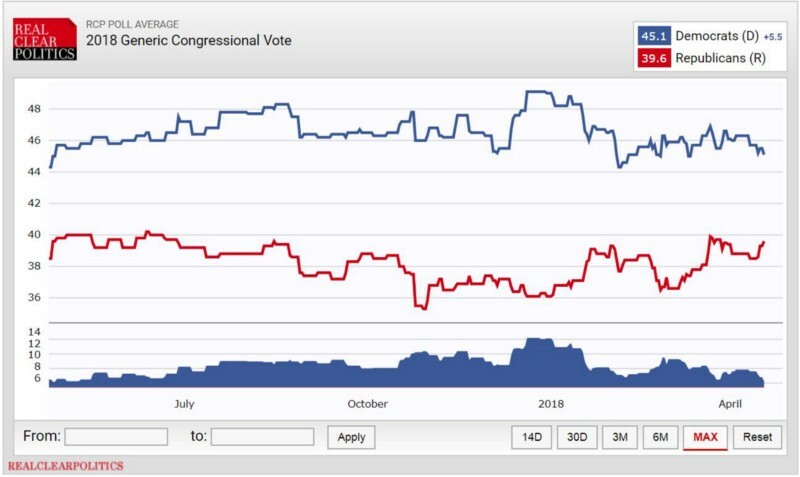 In addition, the generic ballot polling questions regarding the midterm elections are starting to show a small rebound for the Republicans. While the party gap in the poll averages are still over 5 percentage points (in the Democrats favor), it is a big improvement over just five months ago when the gap was near 12 percentage points. One of my favorite movie scenes comes from The Beatle’s first film, A Hard Day’s Night, wonderfully summarizes the political punditry class’s unending quest to predict future trends. 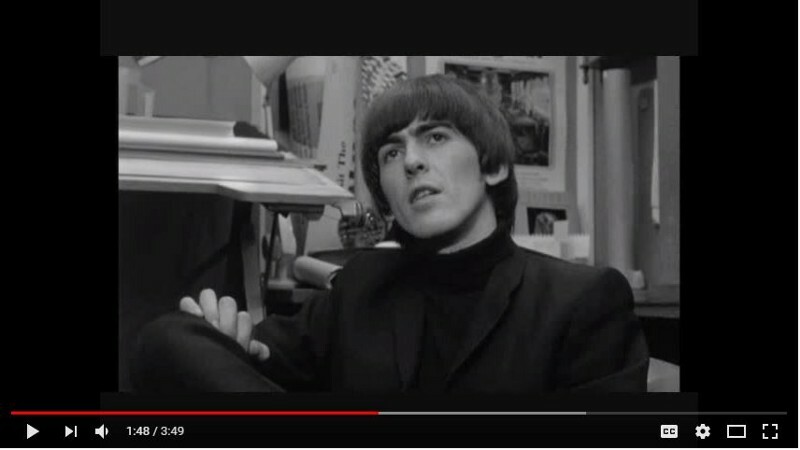 In the scene, George Harrison accidentally stumbles into an advertising executive’s office and finds himself recruited to be in an ad campaign featuring a young model named Susan. “You mean an early clue to the new direction?” she replies. That’s a pretty fair depiction of political polling and marketing as well. Seek the early clues. The new directions. Nate Silver, Kellyanne Conway and Frank Luntz are millionaires for a reason. The smart money still remains solidly in the Democrats’ corner for the midterms. A lot must change in the environment for the Republicans to have any chance of keeping the House. Even as some national poll numbers improve, on a race-by-race analysis, the sudden rash of retirements and the district-level polling data do not bode well for them. Nonetheless, we’ve seen this movie before. Heading into election day, the Democrats are in control. What could possibly go wrong? As inspectors from the Organisation for the Prohibition of Chemical Weapons (OPCW) prepare to go to Syria to investigate the alleged use of chemical weapons in the Syrian city of Douma, the U.S. and its allies are sending mixed messages on what should be the proper response to the chemical attack which left a reported 70 people dead and 500 more injured. French President Emmanuel Macron says he has proof the Syrian government used chemical weapons in Douma, though nothing has yet been released to the public. At the same time, he insists any response to that attack on civilians must not escalate the Syrian conflict. British PM Theresa May has been similarly conflicted and non-committal on what the proper response should be. As typical, German chancellor Angela Merkel has been more decisive, ruling out any German participation in any military action in Syria, and emphasizing instead the importance of unity among Western allies. Where is this all heading? The Russian Defense Ministry says Russia will target any U.S. missiles from their launch point, which is likely to be either the U.S.S. Donald Cook or U.S.S. Porter, two U.S. Navy destroyers already in the Mediterranean. Andrei Kortunov, head of the Russian International Affairs Council, a state-backed think-tank in Moscow, says a military strike against Syria will only escalate U.S. and Russian tensions while doing little to change the trajectory of the conflict. More ominously, he believes a wider Middle East war is possible if such a retaliatory attack occurs. “I don’t want to sound apocalyptic — we are not there yet. But we are moving in that direction,” he said earlier in the week. The U.S. is beyond just ‘moving’ in that direction. In January, the Trump administration decided to permanently separate northeast Syria from the rest of Syria with the intent of keeping Iranian influence out of Syria and keeping the U.S. relevant when a final Syrian settlement is negotiated. The U.S. plan to train the Syrian Border Security Force (BSF), which will be primarily composed of Kurdish fighters along the Syrian-Turkey border, has already aggravated Turkey, which is engaged in its own internal conflict with Kurdish terrorist groups, such as the Turkish Kurdistan Workers’ Party (PKK). Should the Trump administration decide to turn its occupation of northeast Syria into a regime change war, the U.S. will need far more than the 2,000 troops already in place in northeast Syria. But, as we’ve seen from previous U.S. invasions in the Middle East, troop numbers can escalate rapidly once the president gives the order. From late October 2002, when the U.S. Congress approved military action in Iraq (Authorization for Use of Military Force Against Iraq Resolution of 2002), the U.S. and its allies had 125,000 in Kuwait by mid-March 2003 and would add 100,000 more by late April. As with the Iraq War in 2003, when the George W. Bush administration accelerated its “marketing campaign” in September 2002 to sell the idea of an Iraq invasion to the American public, the first indication of the Trump administration’s intent to invade Syria may come from the U.S. news media. Prior to the 2003 Iraq invasion, The New York Times’ Judith Miller penned the first of many disastrously inaccurate stories about Saddam Hussein’s alleged WMD program in December 2001, in what became a coordinated war dance by the national news media by the end of 2002. We may be seeing this same dynamic starting again, evidenced by the U.S. news media’s coverage of the Douma attack which has been peppered with often blustery calls for the Trump administration to escalate the American military role in Syria. The New York Times editorial board (April 11, 2018): “What to do next in Syria is a crucial test for Mr. Trump, who has shirked America’s traditional leadership role. He has tried to seem like a macho leader who would aggressively use American power where President Barack Obama wouldn’t, while talking about pulling out of the Middle East and walking away from international commitments. With such inconstancy, he will not be able to stop the violence in Syria, and with no clear, unified plan with the Western allies, he will only empower Mr. Assad. The New York Times is all but calling Trump a ‘chicken’ and doing the obligatory wing flap and cackle. This kabuki dance the U.S. news media does prior to every new U.S.-led war is predictable. 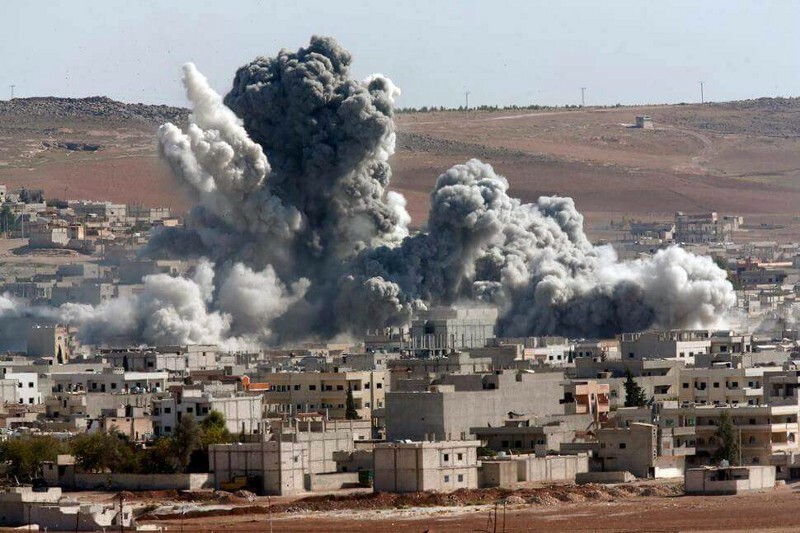 The media, for its part, is in the business of attracting audiences and wars do exactly that. 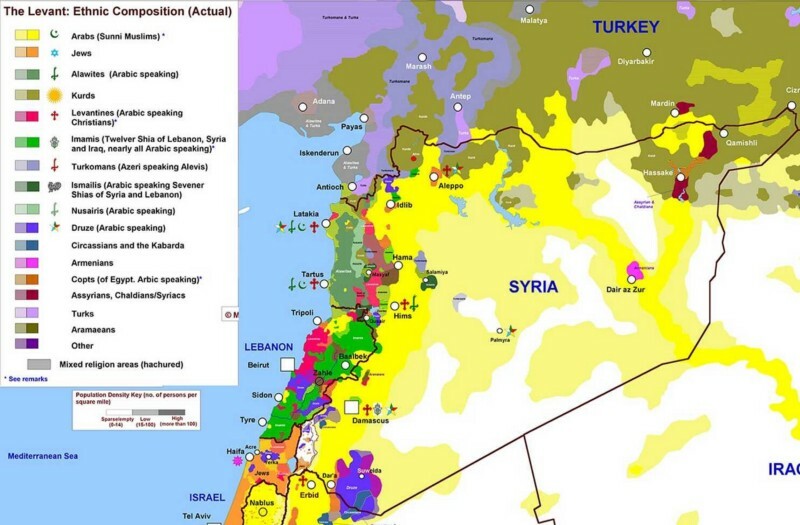 Hopefully, this isn’t the run-up to a much larger U.S. commitment in the Syrian conflict. I fear, however, it is. Donald Trump’s digital strategy in the 2016 presidential campaign, led by his son-in-law Jared Kushner and with a likely assist from the Russians, had a demonstrable impact on the election outcome. If it was not a decisive factor in the final outcome, it was pretty damn close. Its apparent targeting focused on those potential “conservative” voters most vulnerable to defecting to the Hillary Clinton: Less-than-strong conservatives over 40 years of age who used social media to share political information during the campaign. “Slightly conservative” and “conservative” Americans accounted for 25 percent of the U.S. vote eligible population in 2016 according to the 2016 American National Election Study (ANES). And within that 25 percent, just under half of them said they used Facebook or Twitter (hereafter referred to as social media) to share political information during the campaign. That is almost 29 million people. That is a large number of potential voters considering the 2016 electoral college result would have changed if only 70,000 Trump voters in Michigan, Pennsylvania, and Wisconsin had voted for Clinton instead. 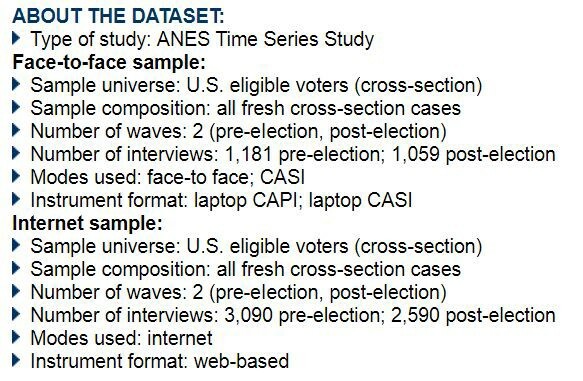 Our findings, summarized below, are derived from an analysis of the ANES, a pre-post election survey fielded by Stanford University and the University of Michigan (see Appendix A for details on the survey methodology). Trump’s digital strategy appears to have been focused on shoring up support among his base by driving up negative feelings towards Hillary Clinton. And, based on the ANES data, the strategy was effective. 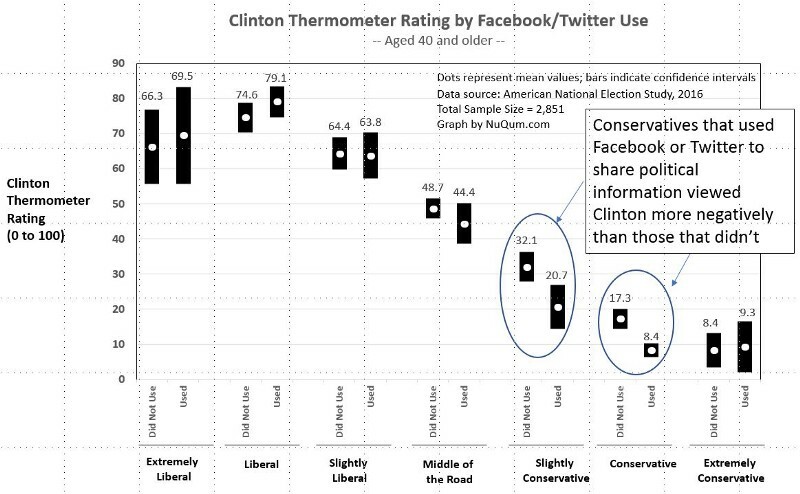 In rating Hillary Clinton on a 0 to 100 favorability scale, on average, “slightly conservative” adults aged 40 or older who used social media to share political information gave her a rating of 20.7, compared to 32.1 among otherwise similar adults who had not used social media for sharing political information (see Figure 1 below). A similar relationship emerged among “conservative” adults (aged 40 or older). Within the other voter segments defined by age and ideology, there were no significant differences in Clinton ratings between social media users and non-social media users. 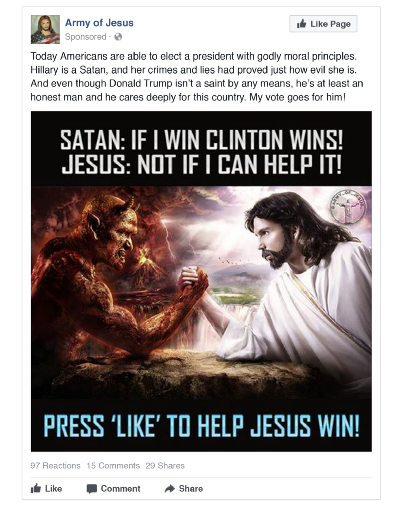 While not be definitive evidence of the impact of Cambridge Analytica or Russian meddling, it is strong evidence of the effectiveness of Trump’s digital strategy. When we looked at the relative difference in favorability towards Clinton and Trump (see Figure 2 below), older conservatives again stood out. 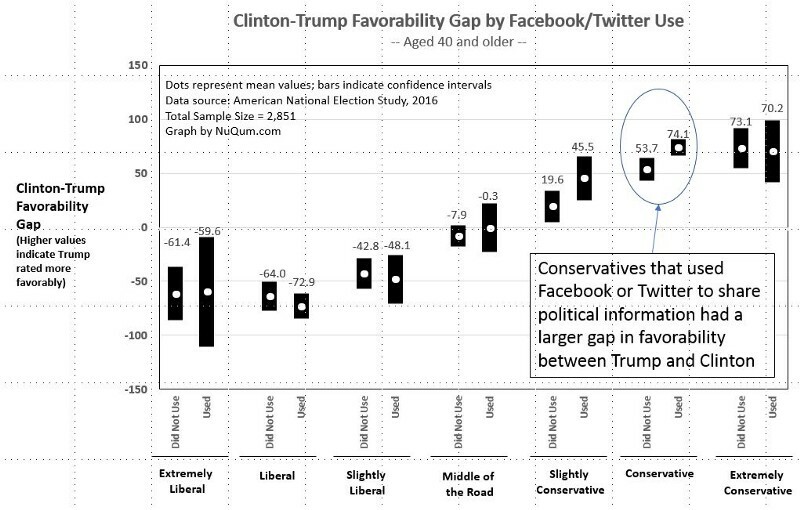 Older conservatives that used social media to share political information were significantly more positive towards Trump relative to Clinton (Favorability Gap = 74.1 points), when compared to those in the same demographic category but who did not use social media for political information sharing (Favorability Gap = 53.7 points). Relative perceptions of the candidates’ honesty was also an important factor in voters’ decision calculus (see Appendix B for a logistic regression model of the 2016 vote choice). 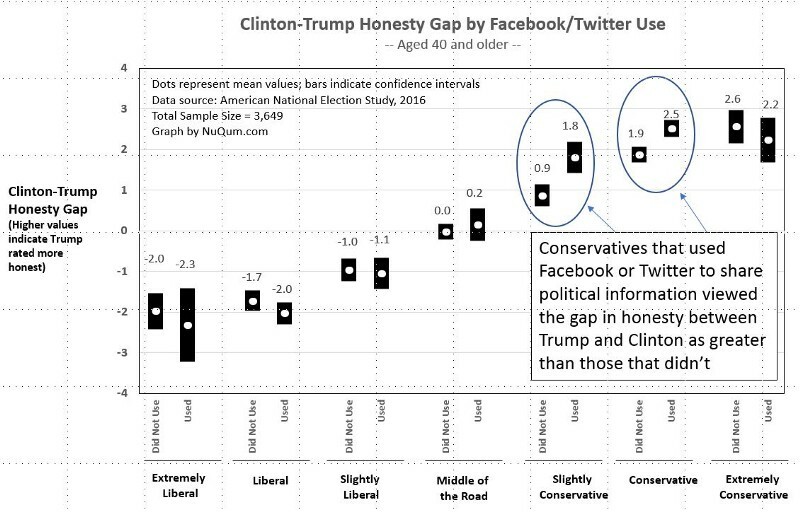 When assessing the honesty of the two presidential candidates, “slightly conservative” and “conservative” adults (aged 40 or older) who used social media also indicated a greater honesty gap in Trump’s favor (Honesty Gap = 1.8 and 2.5, respectively), compared to otherwise similar adults (Honesty Gap = 0.9 and 1.9 points, respectively; see Figure 3 below). 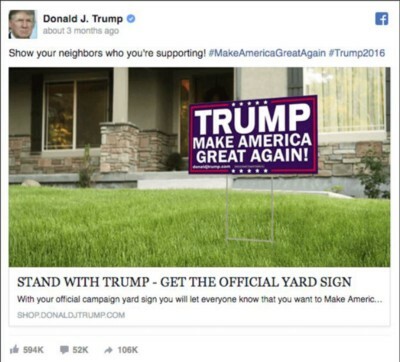 We believe these findings are strong, if not conclusive evidence, that Trump’s digital campaign had a demonstrable impact on the 2016 election. 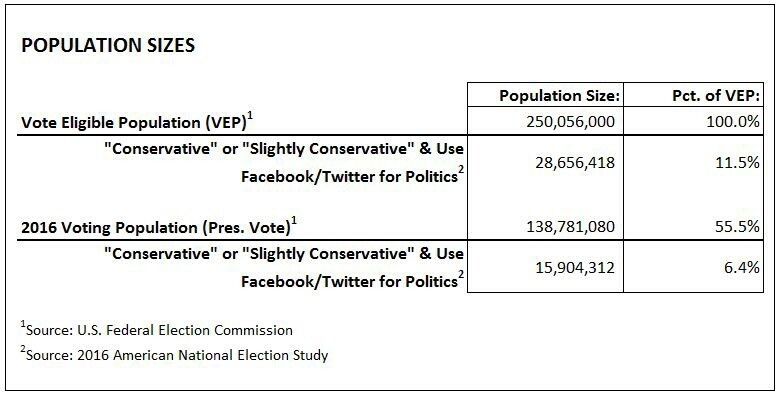 Based on the 2016 ANES survey data, we estimate 28.7 million vote eligible Americans (or about 12 percent of the voter eligible population) were prime targets for the Trump campaign’s social media strategy, and 15.9 million of them voted (see Table 1 below). 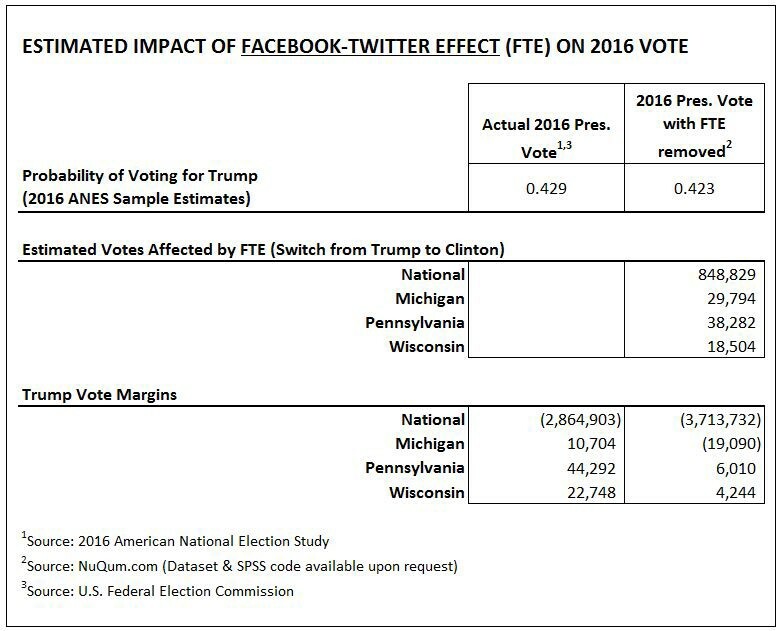 Without the SME, Trump would have lost the popular vote by 3.7 million votes and would have lost Michigan by 19,000 votes (see Table 2 above), yet he still would have won the electoral college in our estimation. But not by much. Keep in mind, we are not considering other subgroups, particularly “middle of the road” voters, that also may have been impacted by Trump’s social media efforts. The 849,000 votes switched estimate is probably conservative. The 2016 ANES data cannot tell us what social media ads respondents saw during the campaign. But our analysis reveals the targeted impact of Trump’s digital strategy. 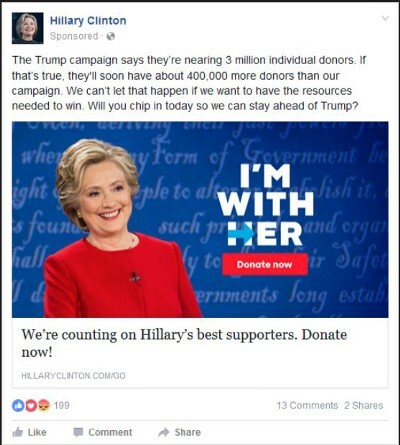 All you have to do is look at some of the Facebook ads from the 2016 campaign to see why Trump’s, particularly those created by the Russians (Internet Research Agency), may have worked better than Clinton’s. 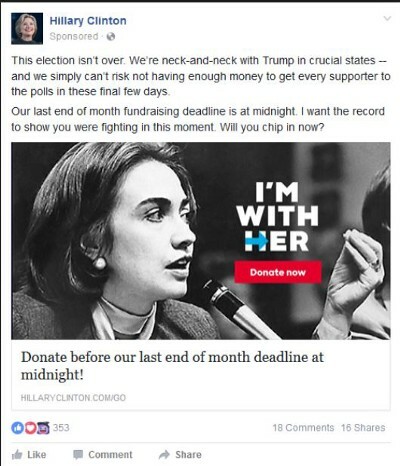 Across the small sample of Facebook ads below, the mainstream Clinton and Trump ads all look professional but are unspectacular and mostly forgettable. 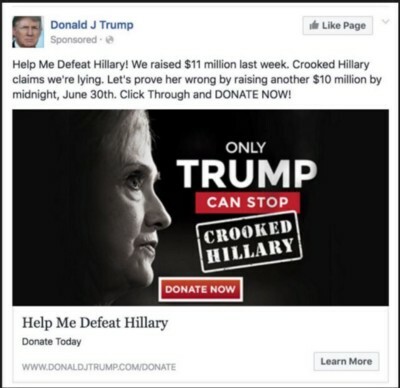 The Trump ads created by the Russians (IRA) are crude, unprofessional, and hard to ignore. For better or worse, Trump’s campaign was about breaking the rules and conventions of presidential campaigning. He was an unconventional candidate and his digital strategy reflected that fact. 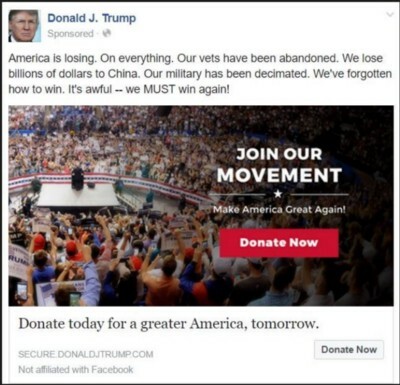 And we now have evidence that the Trump campaign’s digital strategy had a measurable and possibly decisive role in determining the 2016 election outcome. 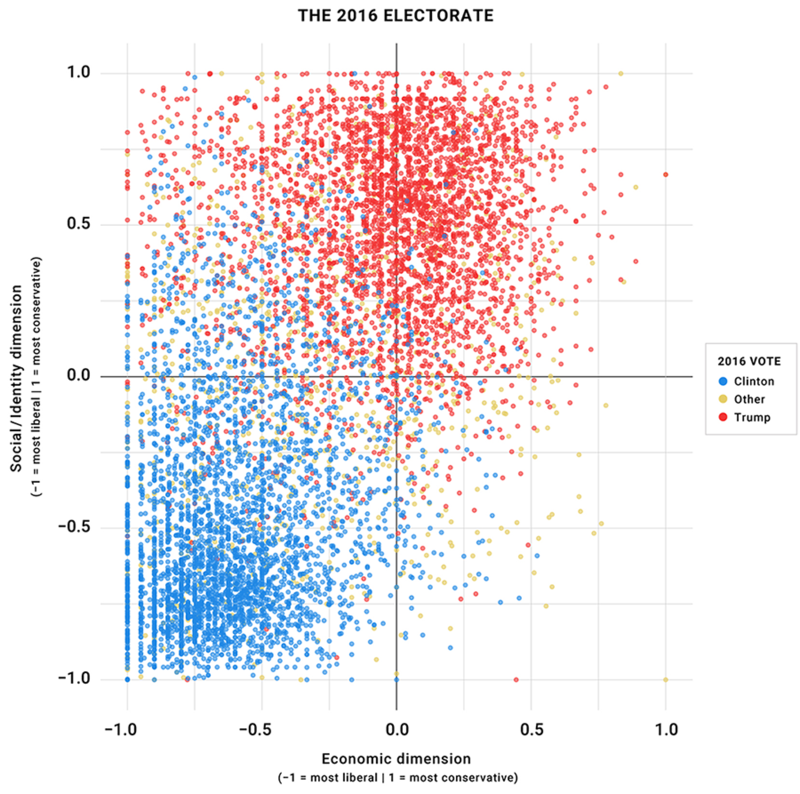 The 2016 American National Elections (Time-Series) Study is sponsored and managed by the University of Michigan and Stanford University. 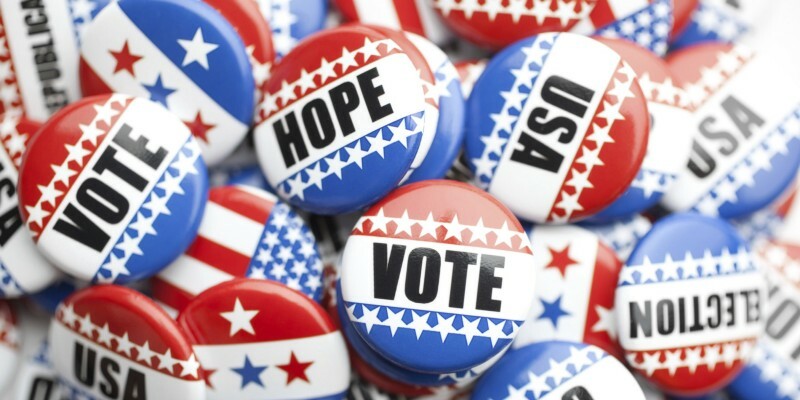 The national survey is designed to assess electoral participation, voting behavior, and public opinion as it relates to eligible U.S. voters. In addition to the political content of the survey, it also measures media exposure, cognitive style, and personal values. Data collection for the ANES 2016 Time Series Study began in early September and was completed in January, 2017. Pre-election interviews were conducted with study respondents during the two months prior to the 2016 elections and were followed by post-election re-interviewing beginning November 9, 2016. Both face-to-face interviewing and Internet-based data collection was conducted independently, using separate samples but substantially identical questionnaires. Web-administered cases constituted a representative sample separate from the face-to-face. Analytic survey weights, provided by the ANES researchers, were used in all of the quantitative analyses presented in this article. A complete description of the ANES 2016, including datasets, questionnaires, and supporting documentation, can be found here. News of another chemical weapons attack in Syria, this time in Douma, reminds us of how deep and unresolved that conflict remains. The Western media have generally been quick to blame the Assad regime for this latest attack, while Assad and the Russians have been equally quick to deny their culpability in this horrendous act that killed at least 70 civilians, mostly women and children. That the blame has been so quickly assigned to Assad’s regime is predictable and with some merit; however, it is the breadth and ferocity of America’s media and governing elite to also blame Donald Trump for this cruel act that is most troublesome. 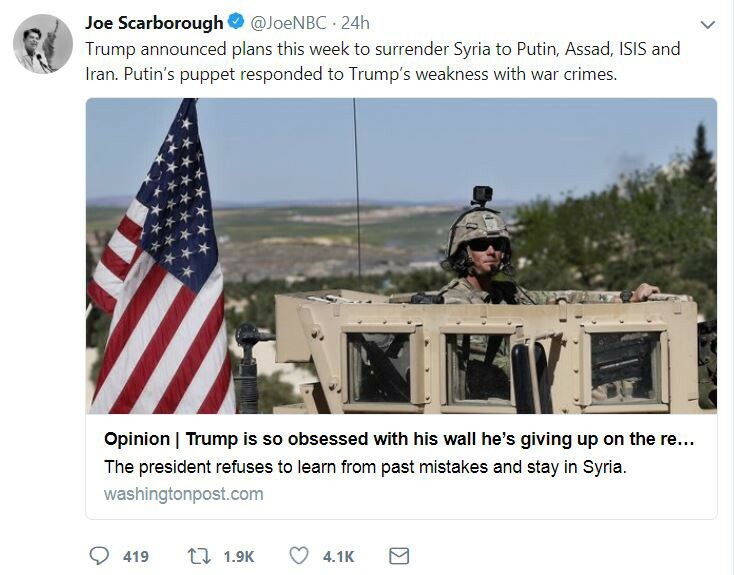 Scarborough’s builds his thesis from the dubious assertion that the defeat of ISIS (at least as a territory-controlling entity) was solely the work of U.S. military strategy and ignoring the fact that, by following Russia’s lead, we stopped fighting a two-pronged war (one against Assad and one against ISIS) and decided to concentrate on the beatable foe, ISIS. The Washington Post’s David Ignatius takes the war-mongering to an even more cynical level by suggesting it is the ‘feel-good’ thing to do. The U.S. doesn’t fight wars so our troops can feel good about themselves. We fight wars to protect our national interests when they are threatened. 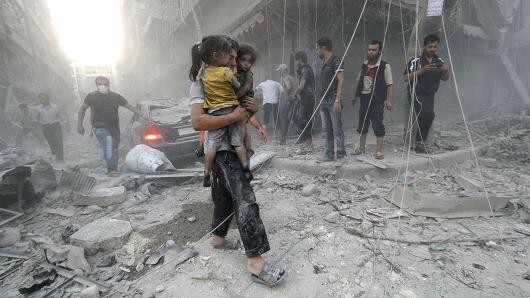 Ignatius should have told the young officer, no need to worry, the war in Syria will never be over. The officer will have plenty of time to rejoin the fight. A fight that Scarborough and Ignatius both suggest the U.S. has learned how to win. After almost 17 years of U.S. troops fighting jihadists and anti-Western combatants, have we really discovered the secret sauce necessary to bring peace and stability to Syria and the Middle East in general? Lt. Col. Daniel L. Davis, USA, Ret., who retired in 2015 after serving in four combat deployments (including Syria) offers boots-on-the-ground experience in the Middle East and concludes that now is not the time for the U.S. to make a bigger troop commitment in Syria. Davis also counters the suggestion the U.S. leaving Syria will embolden Russia. The chemical attack in Douma is tragic and must be addressed by the international community. And should the UN confirm Assad’s role in the attack, there must be an international response that includes holding Russia accountable as well. A new and larger U.S. occupation force in Syria, however, should not be considered one of the viable options. If Trump cured cancer, the anti-Trump media would declare he was a healthy cell supremacist. Sinclair Broadcast Group, the owner of 173 television stations in the U.S., recently required its stations’ news anchors to read a script promoting the objectivity of their news coverage and warning viewers about the partisan bias plaguing other news outlets. In the broadcast business, this is known as a ‘must-run,’ and Sinclair is well-known for using ‘must-runs’ for conservative commentaries. In response to Sinclair’s promotion, the anti-Trump media had a collective meltdown. The irony of Sinclair promoting its stations’ objectivity in news coverage is undeniable. Yet, it must also be acknowledged that Sinclair, as a for-profit business enterprise, has every right to distinguish its service from its competitors, even if it is based more on fiction than reality. As critical as I’ve been about the anti-Trump news media’s reporting (e.g., MSNBC, CNN, The New York Times, The Washington Post, Politico.com, Vox.com, etc. ), I have always supported their right to be biased in their coverage. I also recognize how partisan-driven news attracts audiences which, in turn, generates profits. The Fox News Channel has been proving that for the past 20 years. That is our nation’s commercial news system. We can lament its existence and the lack of mainstream, non-partisan alternatives, but we cannot deny the partisan (anti-Trump) media’s right to do what they do. And Donald Trump has been a godsend to many news outlets, as exemplified by the New York Times surpassing $1 billion in revenues and MSNBC attracting its largest audiences ever this past year. The anti-Trump news outlets have a tangible incentive to be biased. And Sinclair has every right to call them out for this bias, regardless of the hypocrisy involved. The subsequent industry-wide freak-out about Sinclair forcing its local news anchors to read a statement about the importance of news objectivity is equally hypocritical. Fair enough. 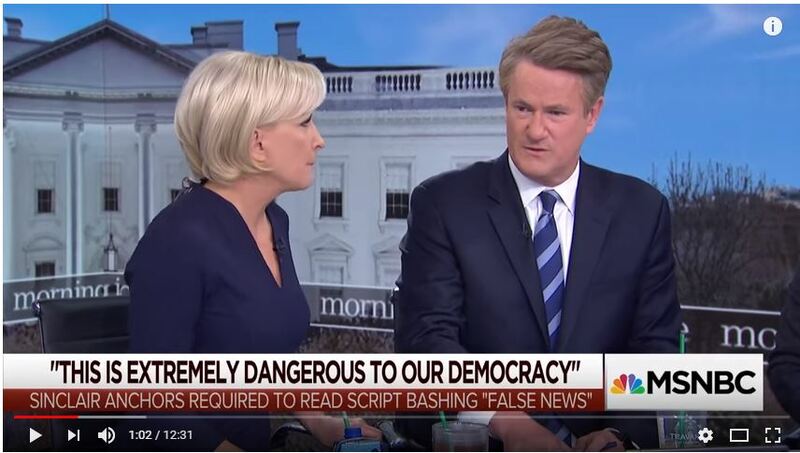 It took some audacity for the Sinclair stations to present themselves as objectivity purists, but was it “extremely dangerous to our democracy”? Really? Our greatest responsibility is to serve our Northwest communities. We are extremely proud of the quality, balanced journalism that [TV Station Call Letters] News produces. Hypocrisy aside, there is nothing democracy-threatening in that first line. But we’re concerned about the troubling trend of irresponsible, one sided news stories plaguing our country. 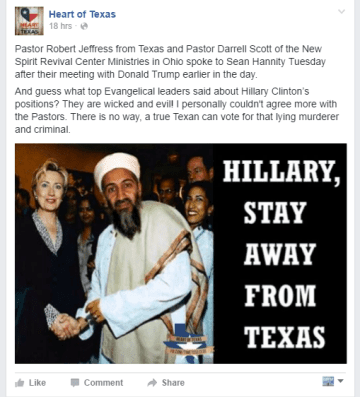 The sharing of biased and false news has become all too common on social media. This next sentence has merit as well. It is not hard to find examples of CNN or MSNBC anchors recklessly conjecturing on what crimes Donald Trump may have committed, based often on little more than hearsay or a cryptic court filing by special counsel Robert Mueller’s investigation team. That’s not objective journalism. That’s called guessing. Of course, I would throw Fox News and Sinclair stations in that mix of irresponsible journalism even though that was not Sinclair’s intent. As for the third sentence, some could interpret it as more of a criticism of the right-wing social media environment than anything else. A broader interpretation is that there is biased and false news stories being bandied about Facebook, Instagram and Twitter from all ideological persuasions. A true statement. More alarming, some media outlets publish these same fake stories… stories that just aren’t true, without checking facts first. Unfortunately, some members of the media use their platforms to push their own personal bias and agenda to control ‘exactly what people think’…This is extremely dangerous to a democracy. That is pretty much what you hear on any given night from anchors on MSNBC, CNN and Fox News, though I would argue they are pushing a ‘corporate bias and agenda’ and not their own. At [INSERT TV STATION CALL LETTERS] it’s our responsibility to pursue and report the truth. We understand Truth is neither politically ‘left nor right.’ Our commitment to factual reporting is the foundation of our credibility, now more than ever. This first sentence in this paragraph is true. The second sentence, ditto. And I really want to believe that they believe in the third sentence, but skepticism is warranted. Nonetheless, Sinclair anchors saying this on-air is hardly a threat to our democracy. I only hope their audiences hold them to that standard. But we are human and sometimes our reporting might fall short. If you believe our coverage is unfair please reach out to us by going to (our website) and clicking on CONTENT CONCERNS. We value your comments. We will respond back to you. We work very hard to seek the truth and strive to be fair, balanced and factual… We consider it our honor, our privilege to responsibly deliver the news every day. Forgive me if these last sentences don’t elicit fear for the impending end of our constitutional republic either. If anything, it is the hyper-sensitive and disproportionate reaction by the anti-Trump media that seems like the ‘fake news.’ Sinclair engaged in a marketing campaign, ham-handed as it may have been, and in that effort enlisted (or, as they say in the military, voluntold) its news anchors, also known as employees, to read a script. That is as much of a non-news story as you can get. If you are a journalist at Sinclair station and you don’t like how Sinclair does business, quit. Which is exactly what one Sinclair employee decided to do. Former Sinclair news director Aaron Weiss quit over the ‘objective news’ promotion and promptly went on CNN to criticize Sinclair for forcing its news anchors to read the corporate-written statements verbatim. His displeasure with the practice is defensible, particularly if any job threats were involved, as he suggested there were. “I have no problem with conservative-slanted or liberal-slanted news, but own it,” Aaron Weiss told CNN’s Alisyn Camerota. But it begs the question, does that also apply to corporatist Democratic-slanted news as well? I’m talking to you CNN and MSNBC. The act of owning one’s political bias assumes a level of self-awareness not common within most people. And, frankly, naming one’s own biases is more complicated than simply referencing partisanship. There are other, often more powerful, biases at play in the media. There is confrontation bias (news organizations like to see stories as conflicts). There is narrative bias (the tendency to connect news stories to larger narratives). And there is, of course, today’s anti-Trump bias (a form of the narrative bias) which transcends partisanship and manifests itself anytime Donald Trump says or does anything. Trump could cure cancer and the anti-Trump media would declare he was a healthy cell supremacist. All the variations in bias aside, partisan bias has become the summary description of the news media today and some media observers are not surprised or alarmed at its rise to dominance. Gabriel Sherman, who covers the media for New York Magazine, believes partisan journalism is the historical norm and it is objective journalism, uniquely post-World War II phenomenon, that is unsustainable. He may be right, but his conclusion exists in the context of a commercial, profit-driven media environment. What he cannot tell us is whether the American public, and by extension our democracy, is better served by a partisan media versus a more objective one. Partisan media do serve a purpose in a democracy. They not only inform voters of the policy and ideological preferences of the major parties, but strengthen the opinion congruence between the party leaders and voters. It makes parties more ideologically homogeneous. 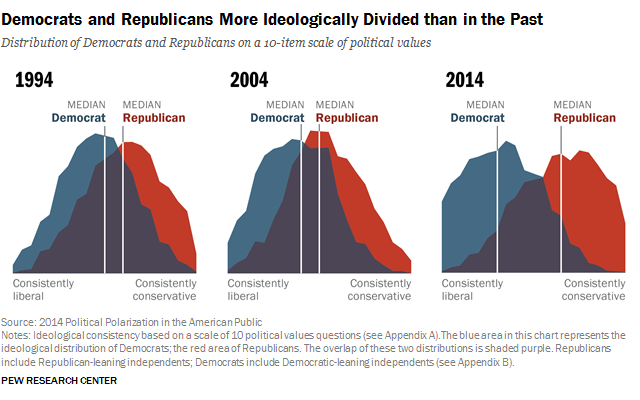 We see evidence of this in today’s highly partisan electorate (see Figure 1 below from research by Dr. Lee Drutman) and from the increasing distance between the ideological centers of the parties (see Figure 2 below from the Pew Research Center). Objective news outlets, on the other hand, helps us critique the performance of the parties, particularly when they are in power. Without the objective news media, the likelihood decreases that citizens will modify their own views as party performance warrants. If a democracy requires anything, it is the responsiveness of elected leaders and policies to the will of the people. It must have the flexibility to change policies as conditions and performance change. The partisan media has made that evaluation more difficult, and that is a very bad thing for a democracy. Today, American public policy does a piss-poor job representing the interests of average Americans. That is not exactly the American democracy I read about in textbooks. And it reinforces the belief that we need to bring objective journalism back into the mainstream of American media. Sinclair’s local news anchors proved they can parrot the ideals of objective journalism, but do they really mean it? And will any other news media organizations follow? In the 2016 election, many people thought President Donald Trump was honest, or was, at least, selectively honest. “He says it like it is — he doesn’t speak out of both sides of his mouth like other politicians,” a Trump supporter told me as he waited for Trump to arrive at a Des Moines, Iowa campaign rally early in the 2016 presidential campaign. What he was describing was more Trump’s off-the-cuff, rambling speaking style, not his honesty. Nonetheless, relative to other politicians, Trump was a refreshing change of pace to many voters. Voters know politicians lie. They even understand why on some level. We all lie over the course of a lifetime for various reasons: to protect someone’s feelings, to motivate people, to avoid a conflict the truth would otherwise ignite, or to hide our own mistakes, misdeeds, or inadequacies. It is human to lie. But not everyone that studies deception and lying agrees with Seager’s conclusion that it benefits society or that all people are predestined to be liars. That last sentence may be a perfect summary of America’s political class. Donald Trump was elected, in part, due to his blunt, unfiltered, and generally unstructured way of speaking. In the view of his supporters, his frankness is one of his defining qualities. To his detractors, at best, he is an “intellectual sloth” prone to falsehoods, if for no other reason than, he doesn’t know the truth in many cases. At worst, he is a scheming charlatan dedicated to abusing the power of the presidency for his own private gain (perhaps to also serve the interests of his Russian handlers). “This seems to be not a mere disinclination but a disability. It is not merely the result of intellectual sloth but of an untrained mind bereft of information and married to stratospheric self-confidence,” Will wrote. But speaking in ignorance, as Trump often does, is a different form of lying. To assert a point of fact while not knowing if it is true seems particularly noxious. It may not fit into a narrow definition of lying, but its consequences can be every bit as consequential. U.S. Secretary of State Colin Powell asserting at a 2003 UN Security Council meeting that Saddam Hussein’s Iraqi regime had an active weapons of mass destruction (WMD) program an example of a political lie? Or was it just wishful thinking given the decision to go to war with Iraq had all but been made? Former members of the George W. Bush administration continue to argue their mistake on Iraqi WMDs was either an honest one or not a mistake at all. But was it something, in fact, more dishonest than simply a breakdown in the intelligence collection and analysis process? If Secretary Powell knew it might not be true, was the WMD assertion just another potent type of political lie? The more conventional definition of lie — when someone with a knowledge of the facts consciously misrepresents those facts to further an agenda — may generally be considered the clearest form of lying, but politicians have mastered other methods of manipulating facts to achieve the same goals. The political dysfunction we experience today is complemented by the inability (or disinterest) of the news media to distinguish between the various types of lies emanating from politicians. Donald Trump saying he is the “smartest person in a room” is not the same as Barack Obama saying, “If you like the health care plan you have, you can keep it.” Both were lies, but one far more substantive than the other. The news media tend to deposit all political lies into a collective bucket, regardless of degree or impact, which doesn’t serve the public interest well. Furthermore, fact-checking websites like Politifact.com tend to focus exclusively on politicians’ statements easily verified through widely-available information sources. But what about situations where the critical knowledge can only be obtained through sources far outside the typical access channels of journalists or the public? Or even members of Congress? The U.S. Special Forces Niger operation was not a secret. U.S. Africa Command (AFRICOM) had been openly posting on Twitter about U.S. involvement in Niger since it started in 2013, reports SpecialOperations.com. If Congress can be in the dark on routine U.S. military operations, it should surprise few people that journalists might also be in the dark. Moreover, the potential for public officials to lie to the news media increases considerably when the government’s activities are off everyone’s radar. The news media is also ill-equipped to separate truth from fiction when they must assess a politician’s intent. We may never know Hillary Clinton’s true intent for why she preferred a private server for her work e-mails over the more legally-appropriate (and probably more secure) e-mail system already in place at the U.S State Department. There is a substantive difference between Donald Trump sending out his press secretary Sean Spicer to lie about the size of the crowd at the presidential inaugural and Hillary Clinton’s mendacity regarding why she needed a private email server. There was a national security interest in knowing the content of Clinton’s e-mails which resided on a unsecured private network. There was nothing at stake with Spicer’s inaccurate boast about crowd size, except his credibility as a press secretary. Yet, Politifact.com gave Sean Spicer’s untruth a ‘Pants on Fire‘ rating, while the truthfulness of Clinton’s claim she authorized a private e-mail server for the ‘convenience’ could not be assessed. Not all lies are equal and treating them as such serves the interests of those telling the most dangerous lies. If, on the other hand, journalists and the political class were to share a common schema for categorizing the various types of lies one hears in the nation’s capitol, it might aid the public in distinguishing between a ‘run-of-the-mill’ Washington, D.C. lie and one of real consequence. During the 2016 presidential, WNYC’s On the Media radio broadcast, hosted by Bob Garfield and Brooke Gladstone, created their own taxonomy of the classic political lies, which included: lies of omission, lies of distortion, lies of exaggeration, the bald-faced lie, and lies that feel like they must be true. All excellent types of lies, but for the purpose outlined in this essay, they fail to distinguish the most toxic lies from innocuous ones. Some bald-face political lies are relatively harmless (Donald Trump: “No administration has accomplished more in the first 90 days.”), while others can lead a country into war (George W. Bush: “Intelligence gathered by this and other governments leaves no doubt that the Iraq regime continues to possess and conceal some of the most lethal weapons ever devised.”). Instead, a useful taxonomy of political lies needs to go beyond simply the content of the lie (exaggeration, distortion, factual omissions) and attempt to discern its scope and purpose. Self-awareness — is there good reason to believe the (alleged) liar knows if they are telling a lie? Impact — does the (alleged) lie relate to a subject matter of great importance or impact (e.g., national security, a major federal policy, etc.)? In many cases, where a lie fits on both dimensions will be a subjective judgment and won’t be known with any certainty, if ever, until many years have passed. In other cases, it may be easier to determine the substance of a lie than the self-awareness of the liar. A liar’s intent is particularly difficult to discern as it often requires knowing what was in their heart at the time they spoke an untruth. Clinton saying “the private e-mail server was for convenience” is impossible to prove as lie unless she left a documented record of saying otherwise. And she didn’t, as far as we know. Still, the taxonomy of political lies can help journalists and the public decide what politician-sourced untruths are more important than others, even when it is unclear if an untruth has been spoken. 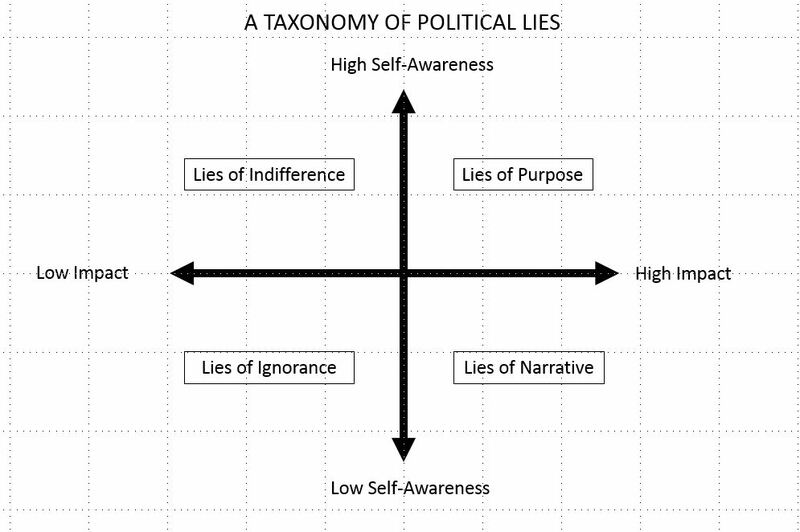 Figure 1 below shows the basic dimensions of the political lie taxonomy. The horizontal axis assesses the potential impact of the lie based on its subject matter. For example, a lie about the outcome of a military engagement is less consequential than a lie about campaign donations. The vertical axis is based on the degree to which the (alleged) liar is aware they are telling a lie. As mentioned, it is usually difficult to know the extent to which the liar is aware they are telling a lie. A better way to utilize the ‘self-awareness’ dimension therefore is to estimate the probability that the (alleged) liar is consciously lying. For example, we can say with high probability now that Richard Nixon knew about his White House’s effort to cover up the Watergate break-in. It always helps, of course, when there is a documented admission as there was in Nixon’s case. In contrast, there is decent probability that Donald Trump believes he had the largest inauguration audience in history. The two-dimension taxonomy creates four categories of lies. There are lies of ignorance, lies of indifference, lies of narrative, and lies of purpose. Generally, the most serious lies will be those with a potentially high impact (Lies of Purpose and Lies of Narrative). Figure 2 provides a short description of the four lie types and Figure 3 offers examples from history of each lie type. 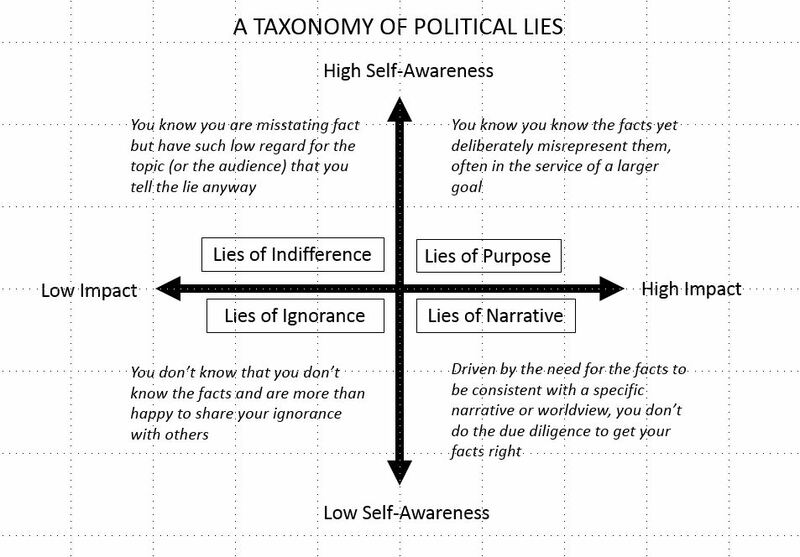 We will start in the lower left-hand quadrant: Lies of Ignorance. This is probably the easiest category to explain and some will rightfully argue this is not really a lie. This is the type of lie where we often speak using gross simplifications, or go “outside the data,” or talk in areas far outside our areas of competency. Such a lie can be driven by a desire just to be social or out of our need to be respected for our intelligence. Insecure people often tell these types of lies and might account for the vast of majority of Trump’s spoken untruths. There is one caveat with this category, however. Being wrong about a point of fact is not the same as lying. 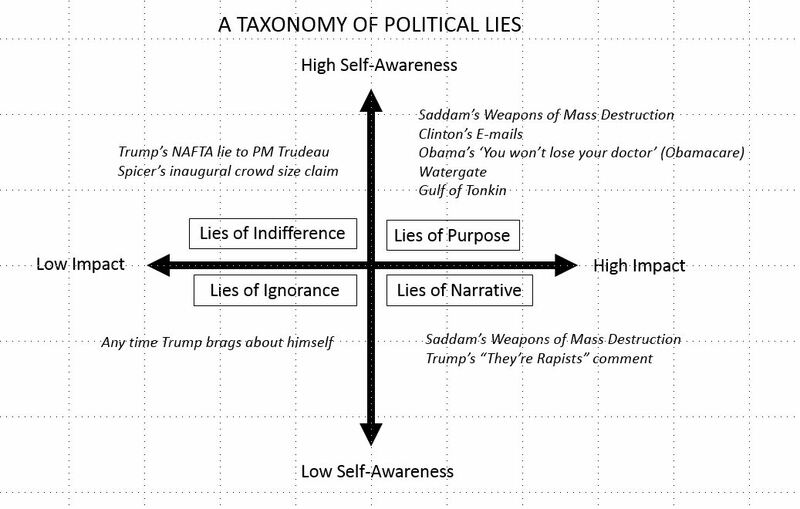 For a politician’s untruthfulness to earn a spot in this quadrant, they must recklessly disregard any attempt to learn the facts before they speak their untruth. I stand guilty of this lie more times than I’d like to admit but it is Trump that has taken this category to weapons-grade levels. The second quadrant — Lies of Indifference — is populated by political lies where the speaker of the lie knows they are lying but it concerns a matter of relative lesser importance. A recent example would be former press secretary Sean Spicer telling the press corps that Trump’s inauguration was the most watched ever. It wasn’t, even if you include online and replay viewers. Some could this is the worst kind of lie, since you knowingly do it even though it concerns something of relative insignificance. Only a congenital liar would potentially compromise their integrity and trustworthiness for a lie whose benefits would be minimal at best. Trump telling Canadian Prime Minister Justin Trudeau that the U.S. has a trade deficit with Canada (which is not true and Trudeau immediately challenged Trump on the claim) was a pointless effort and served no tangible purpose. The third quadrant — Lies of Narrative — includes lies that are often controversial in that the liar contends they ‘honestly believed’ the untruth they told. Short of a deathbed confession stating otherwise, these lies are taken on faith that the liar is telling their truth about their ignorance. What makes this problematic is that lies of narrative concern issues of high importance (national security, federal legislation, etc.). I am convinced that when Trump said of illegal Mexican immigrants — “They’re bringing drugs. They’re bringing crime. They’re rapists. And some, I assume, are good people” — he was certain of his statement’s truth. That shouldn’t exonerate him for the depth of the lie. Lies of narrative, as the label implies, typically propel a larger narrative in the political blood stream. A better example may be Powell’s WND speech before the UN. On his word, I accept that he believed the intelligence given to him. But Powell is a bright man. He knew the score when he was provided the intelligence on the non-existent Iraqi WND program. The U.S. was going to war with Iraq. The narrative was set. Powell just needed to advance the ball one more step. These lies may be the most dangerous as politicians have mastered them as tools to avoid the consequences of their infidelity to the truth. If caught speaking untruths, they just need claim they acted in good faith. As long as they don’t document their deliberate misapplication of the facts, who can prove otherwise? Forthright ignorance is a viable defense in Washington, D.C.
Their defining characteristic is that the (alleged) liar knew they were speaking an untruth but did so in the pursuit of a specific political outcome or personal gain. It was pre-meditated. They didn’t just turn a blind-eye to contradictory evidence. They actively strangled and buried it. When is a lie better than the truth? Yet, today, the observation that lying is an art from in Washington, D.C. is hopelessly banal. Career politicians and senior civil servants cannot survive long without mastering this dark art. Lying is a survival tool and the successful politicians know how to wield its powers. In contrast, Jimmy Carter’s failures as president were exacerbated by his unwillingness to employ it on the political battlefield. In contrast, there is Bill Clinton. A man that many regard as a successful, though under-achieving, president. Perhaps more than any president in history, lies for him were purely utilitarian devices. He used lies the way you use shortcut keys on your laptop keyboard. His lies helped him to survive to fight another day. The ends justified the means, and if it required lies to achieve a larger goal, so be it. The lesson to be learned from the 2016 election is that simple definitions of lying don’t convey their power or their impact on voters. Millions of Americans did not care that Trump didn’t tell the truth a lot of the time. When it mattered to them, they thought he was a truth-teller. Even if the facts proved otherwise. At the end of the 2016 presidential campaign the Washington Post determined that 64 percent of all Trump statements were totally false. Compare that to the average politician who makes completely false statements 10 to 20 percent of the time. The wrong conclusion from 2016 and the Trump presidency is not that we are in a post-truth era. Speaking the truth has been and will always be important, particularly from our elected leaders. What has happened, however, is that the use of lies has become so ingrained in our political culture, we don’t see it anymore. Its like that ugly, textured wallpaper your mom put up in the kitchen in the mid-70s. After awhile, you don’t see it anymore, but it is no less ugly. We don’t need the ‘deep state’ concept to recognize that it is too acceptable for the political establishment to say one thing among themselves, but something totally different when they speak to the public. In fact, the media and political elites lionized President Bill Clinton for his ability to prevaricate for political purposes, even as they feigned in public how disgusted they were at how effortless it was for him to do so. In Topeka, Kansas, that is called lying. In the social circles of our political and media elites, that’s called being smart.